I know “E” is supposed to stand for “Extreme” when it comes to grading, but recently I’ve tried to have a very different take on it. In just the last couple of days I completed a first ascent project at Millstone that many people would think is for all the wrong reasons. It’s not a king line, it’s not the best quality rock and it’s certainly not likely to get a repeat. Why’s that I hear you ask? Well let me start by talking about the last two “dangerous style” routes I did on grit; The Zone and Appointment with Death. Both left me feeling a little unsatisfied. 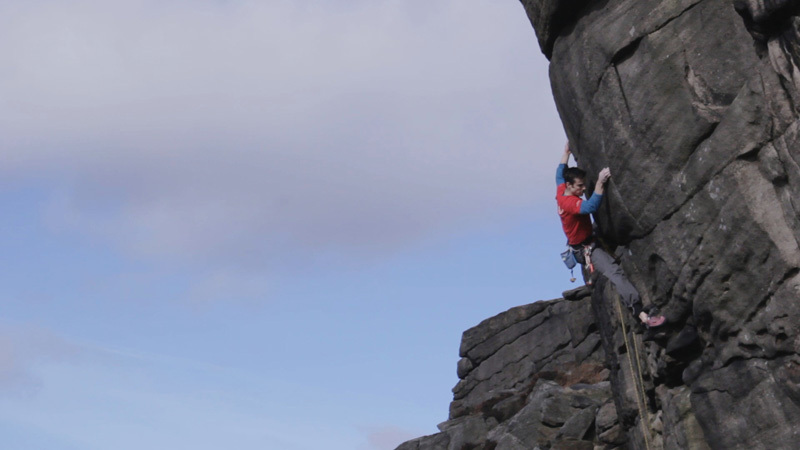 The Curbar E9 wasn’t quite as dangerous as I imagined (especially not after Oli Grounsell unwisely took the tester fall and was ok!) and the Wimberry E9 wasn’t as hard as I thought it might be. Yeah I know I should just take the tick and be happy with it, but in reality I wanted to really push myself in both dimensions. Hard climbing. Hard consequences. 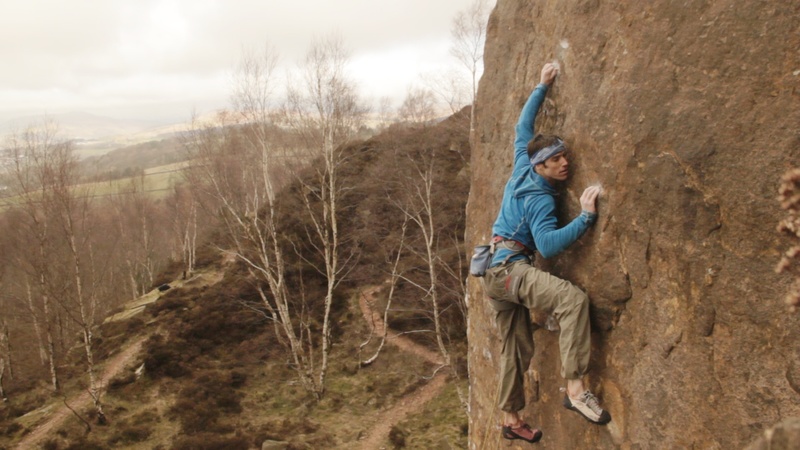 This lead me to scouting around the gritstone edges looking for something that I thought would be of 8a or more to top rope but one where a fall during the hard climbing would lead to hospital. I needed it to be so uncompromising that there was no shirking away from the reality of the situation. If I wanted it, it had to be for the experience. When I abbed down the wall right of Master’s Edge at Millstone I had a good feeling that I’d found the right thing. You could get to the shot holes and then break out on the wall right and climb up on small edges and blunt undercuts running it out 45ft from the shot holes before meeting safety again. 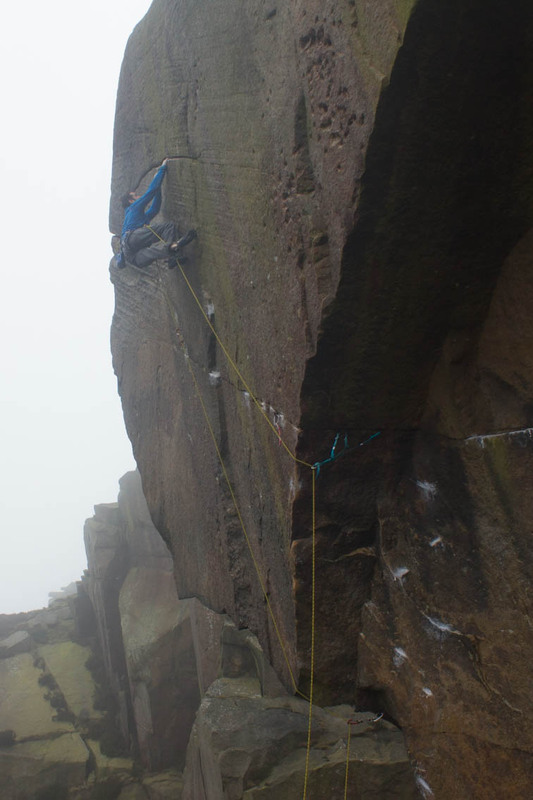 The best thing was that the crux was on slightly snappy edges and at a height where you’d gone beyond the zone of the jug height on Master’s Edge. Nice huh? Photo by Guy Van Greuning – do not use photo without permission. Well not really. Each session I had on the route working it, I felt pretty sick thinking about the seriousness of the route. I think it’s either the mark of a truly psychological route or me getting old. I continually brushed and flexed the holds working out which ones were the most reliable and in the end found a good sequence. Sure the odd one broke, but that was just a reminder that I couldn’t f*&k up. I liked that. When I eventually decided on Sunday to go for the route I was really lucky that the weather was terrible. It was blowing an mini-gale and it was like Patagonia standing on top of Millstone. This meant that psychologically I had no pressure from the route. It had already given me a “get out” and so I only needed to do it if things felt absolutely perfect. The guys at the crag knew it was unlikely as well, so what harm was there in throwing one optimistic top rope on it, just to see how much I’d get blown about. As I warmed up, it became evident that conditions were actually rather good despite the strong gusts. I smiled to myself and thought about how the route had lured me in and now I was ready. I felt calm and accepting of the factors involved. Setting off on the lead I climbed calmly up to the shot holes and explored my head. Everything felt good. I noticed that I’d placed the cam in the hole slightly wrong, but rather than taking this as a portent I simply noted it and stood up into the next sequence. Just before breaking out right into the hard climbing I had a quick shake of the arms and was amazed to feel good. It was just too good. I felt like I was on a VS. Slap out to side pull…. adjust feet….. slap again…. adjust feet again. GOOD. Bone that foothold. Reel that f*&ker in…. slow…. crimp. Bite the tips….pull it hard and slap to undercut…. YES. Ok…. go big now. No thoughts…. OOooop. Yikes. Just for a second or two I fumbled a hold and broke out of the mist. No mistakes though Tom, this is proper. Back in. And then it all came flooding in. The sequence was done and it felt flipping amazing. What a rush. I now just had 20ft of soloing on mellow edges to enjoy on an ocean of millstone wall. What a complete pleasure. It was insane how good I felt in those few moments. Everything I wanted in an experience was right there in just a few Sunday morning minutes. I knew instantly that I didn’t need a hit like that for a very long time indeed. If ever.